The Big Football Game is one of the best days of the year to get together with friends and enjoy some delicious food. Build the ultimate game day “Snackadium” this year with plenty of great BIG GAME snack options from Pillsbury. From Bacon Cheddar Pinwheels to the perfect Football Pizza, make sure it’s one Big Game that you and your friends will want to share. And while you’re thinking about Football Pizza, our new Pillsbury Artisan Pizza Crust with Whole Grain is the perfect option for that M.V.P. performance. Just add your favorite, crowd-pleasing ingredients and in minutes you’ll have a fan favorite pizza that everyone will enjoy! 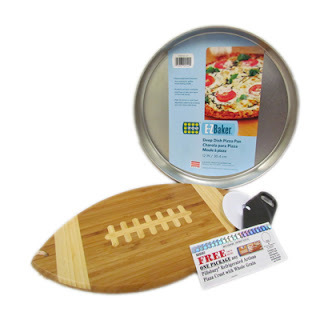 Quick, convenient, and completely customizable, the new Pillsbury Artisan Pizza Crust with Whole Grain will help you add that extra pizzazz to any Football party. Plus, with the health benefits of whole grain, it’s a guaranteed touch down! So go ahead and create your personal pizza creation and add a homemade option to this year’s party spread. It’ll be a guaranteed winner. "Disclosure: The product, gift pack, information, and additional sample have been provided by Pillsbury through MyBlogSpark."